Welcome to the Golf Course View Cluster Association website. 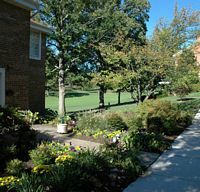 The cluster, or neighborhood, of townhomes is located in beautiful Reston, Virginia, and is situated in the middle of Reston National Golf Course. The original families who lived in the cluster transformed the townhomes into a true community based on shared common values, which included creating a safe haven for its residents while maintaining the splendor of our beautiful natural surroundings. Our community continues to cultivate the values of the original builders and homeowners. Our townhomes retain their charm and architectural design. Our residents, whether they be the original owners or more recent arrivals, work to preserve our sense of community based on the values of family, security, and appreciation of nature. Update your contact information here so that we can contact you via e-mail! This website requires Adobe Reader to view and print some files. Get the latest version.